Accessory exercises help you to target specific muscle groups and strengthen areas of your body and movement patterns that will in turn improve your overall functional fitness. Accessory exercises are a great compliment to any workout, and can be a powerful aid towards improving the more common lifts and exercises within the sport of fitness. Crossfit mainly consists of connected, full body movements, but there is nothing wrong with working on isolated exercises in order to improve your overall performances. 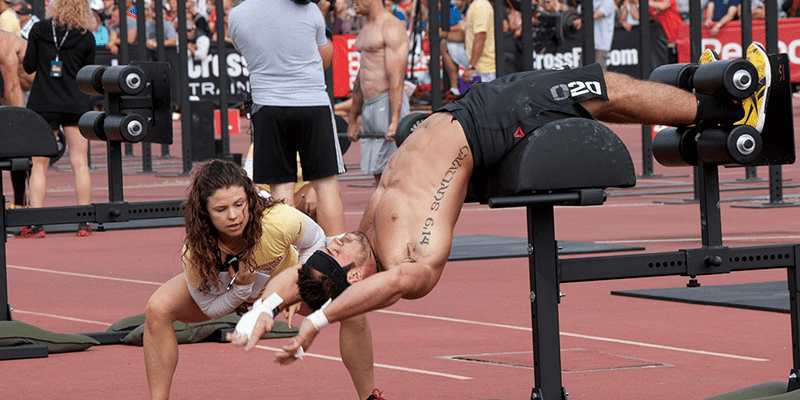 Just because you won’t see any of these movements in the Crossfit Open or any Competition (with the exception of the GHD Sit Ups) it does not mean that you shouldn’t be doing them. Out of many useful exercises, we picked 5 that will help you to improve. Think about all the movements that demand your lower back and torso. Correct, there are a lot! Therefore, you can use Back Extensions not only as a part of your warm up routine, but also to strengthen your core and posterior chain. Whilst we are on the subject of the GHD, why not tackle the other side? GHD Sit Ups are an awesome help to lengthen your hip flexors and get them ready for those squats. Of course they also strengthen your core, which will improve your physical abilities as your core is almost always used in every exercise and movement. From a Deadlift to a kipping movement on the bar, a stronger core will be nothing but an asset. Not to forget the welcome side effect of some ripped abs as well. A strong back is a healthy back. Bent Over Rows are a good way to target muscles you are not using as much in your normal WODs , especially your rear delts. A bent forward posture can easily cause pain in all areas of your back. It emerges when your front is stronger than your back, if you do for example a lot of shoulder push work but nearly none out of the neck. Bent over rows will help you to pull your shoulders back in a neutral position and prevent pain. A common fault with the air squat is when the knees “cave in” medially. This can be fixed by distributing the weight on the outside edges of the feet and pushing the knees outward. Driving the knees outward should be done by everyone but sometimes we need to exaggerate the outward driving of the knees with the aid of bands. This exercise has been around for ages, and for a good reason. You can build tons of strength and even flexibility in the hip flexors and quads without stressing the low back too much. We sit a lot, causing the hip flexors and quads to shorten. By placing the back foot on a bench, you actively stretch the hip flexors and quads one leg at a time. You can also load up this exercises quite a bit to improve overall lower-body strength and muscle growth. These 5 accessory exercises will help you mix things up, target any weaknesses you may have, and strengthen different areas of your body in order to improve your overall performances.